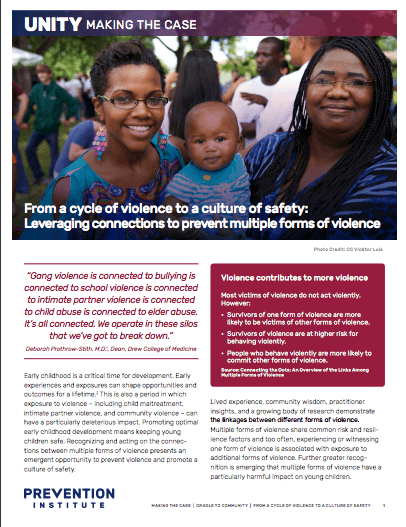 As the PreventConnect community increasingly seeks to prevent multiple forms of violence across the life course, it is critical to think about how violence intersects with early childhood development. Research and practice has emphasized the impact of violence within the home, but little attention has been given to the deleterious impact community violence can have on young children. New Prevention Institute resources explore the linkages between safety and child development, making the case for preventing violence and community trauma. When community environments are safe, they can provide thriving conditions for communities, families, and young children. The Robert Wood Johnson Foundation made a bold investment to bring together Prevention Institute and the Center for the Study of Social Policy for Cradle to Community, a joint project that laid the foundation for critical work at the intersection of healthy child development and community safety. Together with the UNITY City Network and Early Childhood LINC, the project identified strategic policy, practice, systems, and norms change levers to make communities safer so that all children have the opportunity to develop optimally. From a cycle of violence to a culture of safety: Leveraging connections to prevent multiple forms of violence: This paper draws on recent research and analysis about connections between child maltreatment, intimate partner violence, and community violence and makes the case for an integrated movement for safety in our homes and communities. Minimizing the Impact of Adverse Childhood Experiences through a Focus on Adverse Community Experiences: This brief explains the relationship between adverse childhood experiences (ACEs) and adverse community experiences, making the case and providing emerging strategies to address community trauma and build community resilience. Prevention Institute also released new videos about the Cradle to Community approach. In What Does “Cradle to Community” Mean to You?, members of Prevention Institute’s UNITY City Network CSSP’s Early Childhood LINC network reflect on the role we all play in nurturing children from Cradle to Community. Other videos can be found on the web pages for the publications described above. More Cradle to Community resources will follow very soon, including a report summarizing the Cradle to Community system, briefs on emerging topics ( i.e. changing systems, norms, and outcomes for young fathers; and engaging the community development sector for joint outcomes), and profiles about communities taking action. Be sure to receive these materials by contacting Alisha Somji at [email protected].